If you’ve ever depended on the bus to get to work or school or really anywhere, those complaints might sound familiar. But according to a new report from transportation research and advocacy organization TransitCenter, riders are even less enthused about public transit than they were two years ago. The group’s biennial census of transit riders convened six focus groups (including the Philadelphia one), and solicited survey results from over 1,700 riders in the New York, Chicago, Denver, New Orleans, Los Angeles, Pittsburgh, and Seattle metro areas. Today, many regions have cheap gas, easy-come auto loans, Uber, Lyft, and now a new breed of bike- and scooter-share. So transit users aren’t riding like they use to. Where are those former all-purpose riders going? The TransitCenter results point to a growing consensus among transportation experts and researchers: Americans are getting even more into cars. More survey respondents said they had full-time car access than they did two years ago, 54 percent compared to 43 percent. Similarly, the number of respondents who said they didn’t have access to a car decreased, from 27 percent to 21 percent. And while Uber and Lyft have grabbed headlines for convincing people to abandon transit in big cities like New York and Chicago, the TransitCenter advocates argue that the effects of those services are limited to just a few dense, urban places. “The broader issue is clearing space for your transit to get through congestion, and most of that congestion is from private cars, not [ride-hail],” says Ben Fried, the group’s communications head. “Cities need to make transit fast, affordable, convenient.” Truly attractive transit has to do that better than private cars. Transportation advocates argue that the creeping shift from transit to private vehicles isn’t good for cities. It’s not space-efficient: A bus carrying 40 people takes up way less room on the roads per passenger than a person driving herself to work, as 76 percent of Americans do. It’s not equitable. Private cars are expensive, and lifting off the pedal of transit investment in favor of car infrastructure leaves lower income people to suffer with crowded commutes and infrequent service. Then there’s a climate argument: Buses and trains are more emission-friendly than single-occupancy cars. 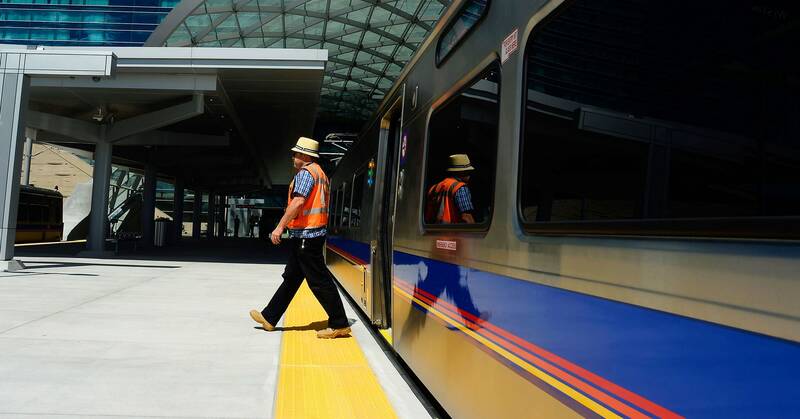 Meeting regions’ climate goals demands cities get better about transit. That might mean there is an opportunity to convince those riders to get back on the bus, or train, or light-rail. Survey respondents who reduced their transit use said their number one transit wish is more frequent service, followed by safer, and then more predictable, trips. Making that happen is no small order, but some places have pulled it off. Seattle, for example, plans to invest $53 billion in light-rail and in 2014 passed a 0.1 percent sales tax to support its bus system. Its ridership (and particularly bus ridership!) is up. Oh, and traffic is down. And the TransitCenter survey respondents in Seattle cited improvements as a reason they took transit more often.